Response card: Green Cotton Rag Cardstock. Response envelope: White A1 size (4-3/8x5-3/4). You print 4 per sheet (7x10 inches) and cut, or we print and deliver finished size. Eco Letterpress Booklet made from deep spring green handmade cotton rag paper. Letterpress printed cover. Booklet is diecut and scored, with a handsome pocket for rsvp set or enclosures. Booklet style invitation sheet - perfect for 2 language wedding invitations. Please Note: We upgraded the envelopes for 2010. The mailing envelope is 100% cotton Lettra Crane envelopes now. We also switched the interior printing sheet (the invite sheet) to 100% Crane cotton paper as approximately 2% of our customers were having some trouble printing on the silk paper. Thank you! If you want us to print, and really want the silk and cotton paper, please call us and we will send you the silk and cotton paper. Modern landscape design belies that this is one of our budget designs. Mails flat in an A7 size envelope. 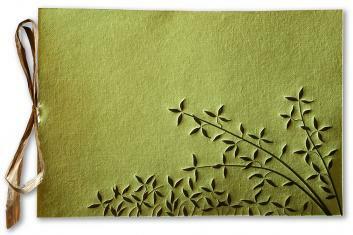 Beautiful handmade paper in lovely spring green with original design letterpress printed in chocolate brown ink. PAPER FACTS: Portfolio wrapper made from recycled cotton rag handmade paper from India. Diecut and letterpress printed here in Pasadena. Inside invitation sheet made from 100 % cotton paper, made in the USA by Crane. Envelopes made from 100% cotton Crane paper, made in the U.S. Envelope: White 100% cotton Lettra paper envelope. Invitation Sheet:White cotton Crane smooth paper. Prints laser or inkjet. Tie:Half yard of brown paper raffia.